Property Vault Limited (PVL) is Real Estate Marketing, Development, and Property Management Company. 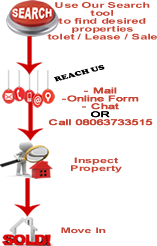 We are a Nigerian Property listing, sales, rental and solutions engine with the objective of developing and managing properties of the highest quality and standard. We also market products from other real estate players to an enormous client base using the best technologies. Our goal is to empower consumers with the most thorough information on the market and bring them in direct contact with the agents. Our listings of over 30,430 properties, aims at providing you with as much information as possible and an in-depth insight on each property enabling answers to any property need or enquires. Our expertise also covers property brokerage, negotiating and structuring joint venture investments, property development analysis and project management. PropertyVault is an emerging leader in the Nigerian real estate industry, our competitive edge is our competitive service delivery style, as well as our team of seasoned professionals united by a firm resolve to deliver. Our Database has thousands of property for Sale/Lease or rent and commands thousands of visitors on a daily basis. At PropertyVault Limited, we specialize in helping people find their ideal home, land and commercial property. Our Agents are well equipped and they have the direct mandate for the property straight from the owners, bringing greater efficiency to the Nigerian real estate market. We call our Agents/Developers partners for that is actually what they are. Our expertise also covers property brokerage, negotiating and structuring joint venture investments, property development analysis and project management. Property Vault is an emerging leader in the Nigerian real estate industry, our competitive edge is our competitive service delivery style, as well as our team of seasoned professionals united by a firm resolve to deliver. Our Database has thousands of property for Sale/Lease or rent. Upon official launch of the PROPERTYVAULT brand early last year, real estate players populated our vault with their products amounting to over Thirty Thousand, Four Hundred and Thirty (30,430) properties spanning across the different categories of property types to meet all needs from land, apartments/ flats and warehouses to office accommodations within Lagos and Abuja as it is which highlights our credibility and resourcefulness. Noteworthy also is the fact that our web portal is currently hosting close to 3000 guests on daily basis and still counting as increase in requests is recorded. This is evident in our daily Traffic Report which can be made available for anyone to see. Propertyvaultng.com is an ICT driven real-estate solution platform which is online real time with the aim of making property sales and rental easy and secure for both buyers and sellers as well as to give ease of accessibility for both parties. Applauded as a revolution in the real-estate industry, www.propertyvaultng.com is developed to change the face of real estate business in Africa creating veritable partnership in operations as well as in service delivery impacting the industry with informed solutions second to none. My House Project: Having studied our environment as well as our behaviors as individuals, we decided to bridge the gap between You and Your Dream Home. My House Project is an iconic tailored real estate innovation for you which provides options for home ownership in the best way ever imagined involving simplified processes and expectation. Mountview Shopping Center: is a mega shopping mall with unique identity providing over 11,000sqm let-able space with 4,000 sqm adequate provisions for car parking lots located in the heart of Lifecamp, Gwarinpa – Abuja. The lifecamp axis hosts over four to five thousand houses which include high brow estates like Godab, Brains and hammers, Monarch Garden, Canaan, Palm city e.t.c. The complex is planned to be a one stop shop for several necessities like electronics, ICT appliances and consumables, building materials, retail super mart and banking halls. It is designed to attract shoppers from Gwarinpa, Jabi, life camp, utako and even from city town. The complex is structured for different shop sizes ranging from 55sqm to 3000sqm.